With Sentinel Spectrum you can protect your dog from both heartworm and fleas! And that's not all Sentinel Spectrum protects your dog from six types of parasite in all - heartworm, whipworm, hookworm, roundworm, tapeworm, and fleas! Also, administering the monthly tablet is a piece of cake thanks to Sentinel Spectrum's beef-flavored chewable and tasty design. 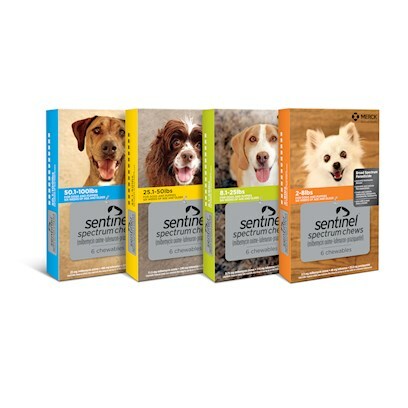 Sentinel Spectrum is sure to keep your dog pest free. Transient hypersensitivity reactions (labored breathing, vomiting, hyper salivation, and lethargy) may occur mildly and have been seen to occur in some dogs that have had milbemycin oxime carrying large numbers of circulating offspring treatments (microfilariae). Side effects presumed to be due to protein release from dead/dying offspring. Not intended for use on puppies younger than 6 weeks old and/or 2 lbs or less in weight. Sentinel Spectrum has not been tested for use in breeding and/or lactating females. Doses are based on body weight of your dogs. Doses are intended for once monthly treatments.